When fourth-grader Corry Brinken asked astronaut Tracy Caldwell Dyson what challenges she faces as the only woman on the International Space Station, she answered honestly: "I have no one to talk to about my hair. It's a big nuisance sometimes and I'm the only one up here who seems to have that complaint." While Dyson spoke, her brown mane swayed above her head in the microgravity of space as students shouted their admiration. Brinken, from Polk Street Elementary School in Franklin Square, was part of a group of 290 students from seven Nassau County school districts who engaged Thursday in a live video dialogue with Dyson at the Cradle of Aviation Museum, a first in Long Island history. Questions from 20 students from the Franklin Square, Freeport, Wantagh and Westbury districts were approved by NASA to be part of the 20-minute real-time discussion of science, space and the challenges of exploring the heavens over a special downlink provided by Cablevision, which owns Newsday. Elementary school students from Bethpage, Great Neck and East Williston also attended. "It's such a nice day for students to see something that they would never experience in their classrooms," said Kim LaRegina, 34, a fourth-grade teacher at Franklin Square's John Street school. 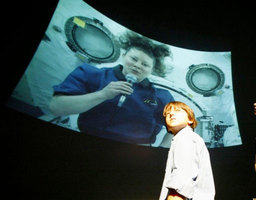 The Cradle of Aviation Museum, in East Garden City, is one of six institutions around the country selected by NASA to participate in the "Teaching from Space" program this year, which hopes to spur student interest in science, technology, engineering and mathematics. "The Cradle is really trying to promote those areas, get kids excited in those areas and to seek careers in those areas," said Jennifer Baxmeyer, education director at the Cradle of Aviation Museum. In partnership with the museum, students from Franklin Square, Freeport, Wantagh and Westbury have been taking weekly classes and participating in hands-on lessons. They have researched the ISS and Dyson herself, a California native who has been onboard the space station since April, orbiting 220 miles above Earth alongside two cosmonauts from Russia. "This is better than doing the Pythagorean theorem," said Amanda Majano-Rodriguez, 11, from the Drexel Avenue School in Westbury, who asked a question about exercising in space and learned that the ISS has onboard a stationary bicycle, treadmill and universal weight set. The students have been suppressing their excitement: the downlink was postponed two previous times. Benjamin Steinberg, 11, from Wantagh Elementary School, considered it worth the wait. He said he expected the downlink to be like a webcam chat, but was pleasantly surprised. "It was so much more," said the fifth-grader. "It was really great." Nasir Letman, 10, from Freeport New Visions School, loved seeing Dyson on the big IMAX screen. "I feel so happy," he said. "This is probably my best moment."